Class: Sophomore Hometown: Pittsburgh, Pa. 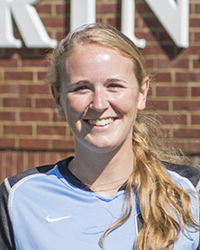 Two-year letterwinner... 2015: Appeared in six games as a reserve goalkeeper ... Combined with Nicole Lapia for five shutouts ... Career-high 45 minutes against both Bethany and Thiel ... Made two saves in games at Thiel and against Chatham ... 2014: Made two saves in first collegiate appearance at Chatham.